This Repo Man Goes After Officials Who Misuse Money Meant To Fight AIDS, Tuberculosis, Malaria : Goats and Soda When he isn't fixing up vintage cars, Cees Klumper goes after officials who misuse money meant to fight AIDS, tuberculosis and malaria. No, he didn't repossess this car from a corrupt official. 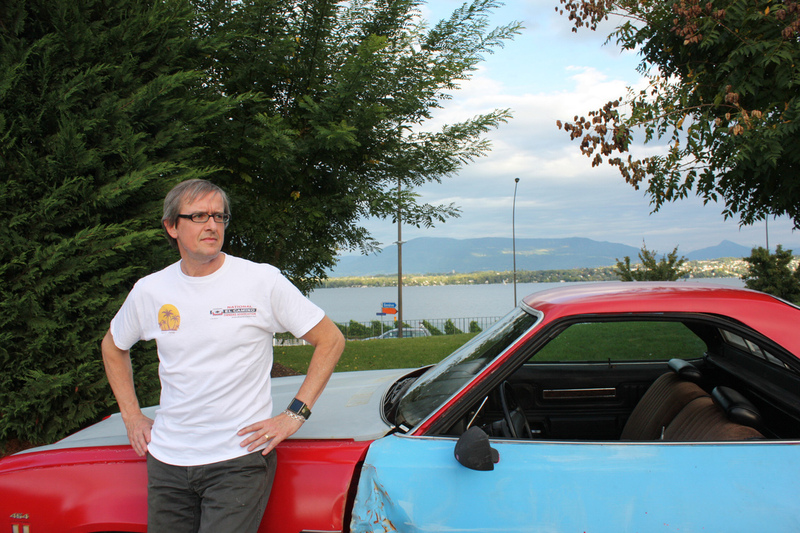 As a hobby, global health avenger Cees Klumper fixes up classic cars. This one is the actual El Camino used in the TV series My Name Is Earl. Klumper tracked it down and had it shipped to Geneva. If you're a government official, you don't want to get a call from Cees Klumper's office. Because there's a good chance what you'll hear is basically this: "Either you send us back the money that was misused in the past, or we'll deduct double the amount from your future grants. It's your choice." That's the message Klumper says he routinely delivers to governments as well as to some companies and NGOs. He's the "Chief Risk Officer" for the Global Fund to Fight AIDS, Tuberculosis and Malaria. But a better title might be repo man. The fund is one of the world's biggest international donors to world health programs, giving out $4 billion a year to governments, for-profit companies and NGOs. Klumper's charge: to recover tens of millions of dollars that corrupt officials at some of those entities have stolen over the years. We were intrigued by this recent account in the Lancet and asked Klumper to tell us more. How have these corrupt grant recipients tried to scam the Global Fund? "Whenever you provide funding to people and ask them to do things there will always be some people looking for the opportunity to take some of that money for themselves," cautions Klumper. "That's not unique to developing countries. That's the case everywhere from Mali to the country that I'm from, the Netherlands." In the Global Fund's case, he says, a lot of the fraud has involved the large-scale purchases his organization finances. "For instance in 2010 in Burkina Faso there was a need to procure bed nets [to protect people from malaria-bearing mosquitoes]. And the private companies the government contracted with to do the procuring [with grant money from the Global Fund] basically defrauded us by procuring the bed nets from a supplier that wasn't approved by the World Health Organization. The bed nets they purchased were much cheaper than WHO-approved nets — and they weren't treated with insecticides. But they charged the Global Fund grant for the full amount of what proper nets would have cost. This was ultimately a fraud to the tune of about 9 million Euro [about 10 million U.S. dollars]." While that's an extreme illustration, Klumper says, similar instances abound. "In Cambodia, for example, there was a case in which two bed net suppliers bribed government officials to get awarded the contract [for bed nets bought with Global Fund grant money]." In that case the bribes amounted to nearly $480,000 — small potatoes by the standards of the Global Fund's budget, says Klumper. "But we felt we had to really persist in going after those funds, which was seen as unusual. People are not used to donors being so dogged." "Training programs are another category of expenses where we've seen a lot of misuse," he adds. "One of the necessary activities is training of health care workers. And the grants can be charged for trainings that never happened. You get invoices for hotel rooms, per diem expenses, supplies used, all of which appear legitimate but which are forged. None of it ever happened." I can see how the Global Fund could uncover this kind of fraud once it launches an investigation. But how do you even know to investigate? Klumper says the tipoffs have come from a range of sources. "Whistle-blowers can approach us through our 24/7 local-language hotline. There are also independent agents, typically accounting firms, that we use in each country to provide regular verifications of program expenses." And he adds that all this come on top of the mandatory annual external audits that the Global Fund does as well as country-specific audits conducted by the Global Fund's investigative arm — the Office of the Inspector General. How did you end up taking on this mission of recovering misspent grants? "The Global Fund, in 2010 and 2011, was under lot of scrutiny for the way it had managed risk in the programs it supports in over 130 countries," says Klumper. (Subsequent investigations have determined that more than $102 million was lost through fraud by grant recipients through June of 2015 — with much of that misuse taking place before 2012.) Klumper notes that the Global Fund's own donors were outraged — the organization is a partnership of major funders ranging from the U.S. government to the Gates Foundation. "An independent high level review panel was appointed," says Klumper, "and one of its recommendations was that the Global Fund set up the risk management office." Klumper was a natural choice to lead it. At the time he was heading up fraud investigations for a similar organization, GAVI, a global vaccine alliance. Klumper joined the Global Fund in 2012, and he says since then, "a lot of my energy has gone into answering, What can we do to better prevent fraud and misuse from occurring. What sort of control measures? What oversight from auditors that we appoint?" Just as important he says, has been recovering the huge sums lost through past misuse. So about this 2-for-1 penalty the Global Fund is now employing — you're basically telling governments that unless they repay money lost through fraud, the Global Fund will take twice that amount out of any future grants. How did the Global Fund come up with that? "Well, in 2012 I started to structure a process to review these [past fraud] cases and systematically work on capturing the misused funds," says Klumper. To date his team has been able to negotiate reimbursement of about half of the missing monies, with another roughly 4 percent written off as un-recoupable — for instance, because the fraud was done by private entities that no longer have assets that the Global Fund can go after. But in many of the remaining cases, Klumper says, "we started to find situations where entities — a lot of times governments but also NGOs and others — basically refused to own up to their accountability. People would use the excuse that this happened so long ago — that this was done by, for example, the former minister of health or the former government. They'd say, 'I'm new. What do you want from me?'" Or, says Klumper, "they'd argue, 'Sure, you have that report from your Inspector General [finding fraud], but we have our own laws and rules and until we do our own investigation and find something wrong we're not going to entertain your request for reimbursement.' And then we'd say, 'Well, you signed this agreement that if we did an investigation you would honor the results." The back-and-forth became excruciating, says Klumper. "You start getting into this impasse where we felt after sometimes years of negotiating, and discussing, and getting one excuse after another, the result was no remedy." As they batted around possible solutions, says Klumper, one of his colleagues — Mark Edington, head of grant management for the Global Fund — floated the 2-for-1 penalty idea. "He just said, 'How about this?' He [initially] saw it as a way to actually recover the funds. We then had a big discussion with our accounting folks and we concluded that sending less money in the future doesn't actually count as recovering money that was stolen. Still, it is a resolution that is defensible. So we decided to take it to upper management and our board." In November of 2014, he says, the board gave the green light. "They said, 'Okay, you can use this as a measure of last resort." What about those cases where the fraud was committed by officials of a government that's no longer in power? Isn't it unfair to penalize the new government? "We've basically not listened to those arguments because, if you do, it's the beginning of the end," says Klumper. "And we've found that in most cases governments say, 'Yes, we will honor this obligation. Even though it wasn't made under our reign, the country was committed to it.' For instance, we're very close to an agreement in that Burkina Faso case. It's a new government and it could use that argument, but it's not doing so. So when a government does try to make that claim, we just say, 'No, it doesn't absolve you.'" On the Cambodia bed net bribery case, for instance, "we insisted on recovery and the government then published the fact that they had recovered the funds from those individuals, so they could channel the money to us." Still the threat of the 2-for-1 penalty hasn't always succeeded in getting countries to reimburse misused grant money. How many times have you actually imposed the penalty? Klumper says there have been four instances to date: with grants to Bangladesh, Guatemala, Nigeria and Sri Lanka reduced by a total of $14.8 million. The Bangladesh case sticks out particularly in his memory. A Global Fund investigation determined that an NGO the Bangladeshi government had contracted to do HIV/AIDS prevention work financed by a Global Fund grant, had instead stolen at least $1.9 million over a five-year period through 2009. "If you read the investigation report, it's so damning — it's really wholesale fraud," he says. "It wasn't a huge amount in the big scheme of things, but the nature of the fraud, and the behavior of the people responsible, and the lengths they went to disguise the misuse of the money was so in-your-face. And then the government agency involved just refused to engage with us and do the right thing." In fact, says Klumper, such cases have spurred him to propose that the Global Fund take the 2-for-1 penalty a step further. "One of the things we're most likely going to be doing at our next board meeting in April is, in those few instances where the penalty is applied, to name and shame the countries more publicly and to perhaps find ways to draw more attention from local media. The idea is to increase the consequences of the penalty. Just deducting the amount from the future grants may not be enough, we need to publicize it." Do you feel sorry for ordinary people living in the countries that get penalized? After all, the fraud wasn't their doing — but they're the ones who ultimately suffer. "So my answer is that, because the Global Fund is underfunded, we always have less money to spend in all these countries than what the need is," Klumper says. "In other words, everybody is only getting a percentage of what the true need is. So the penalty just amounts to taking funds from country A and sending it to country B — which also has a need. Different people will benefit than the ones who were originally intended to benefit. But in the end, the overall impact will be the same. The funding is not going to waste."